My divorce will be final this summer and I’ve started dating. When is it ok to introduce my kids to someone new? First of all, kudos for keeping your children’s best interests in mind. Divorce is traumatic for everyone. Even in the best “conscious uncoupling” situations, it can cause massive disruption and require a lot of adjustment (logistically, emotionally, etc.) in young lives. I am a firm believer that both parents should take ample time to heal and reflect before jumping into a new relationship. While there is no set timeline, I recommend waiting at least six months after your divorce becomes final. You want to make sure the relationship with this new person is serious and likely long term. (I do not recommend introducing your children to someone who you don’t envision being in your life in the distant future.) And that’s hard to know early on, especially within the first three or four months of a relationship. People reveal themselves over time, so wait and see without bringing your kids into the equation. Also, since you have yet to finalize your divorce, your children may still be undergoing an emotionally stressful transition. Be sure to separate your time with your children from your adult time. When you’re with your kids, be fully present. Listen to your children, ask them questions, and – most importantly – validate their thoughts and feelings. Similarly, if you have older kids (let’s say, 12 and up), refrain from oversharing as if you’re friends. They don’t need to know details of your romantic relationships (trust me, they don’t want to know). Kids need parents to act like parents – not best buddies – no matter how old they are. Yes, divorce can seem like a nightmare. But, with the right guidance, it also can be a catalyst for positive change. Let’s talk. As a professional therapist, I can help you navigate life after divorce, and transform unwanted stress into welcomed wellness. Are you experiencing life after divorce? 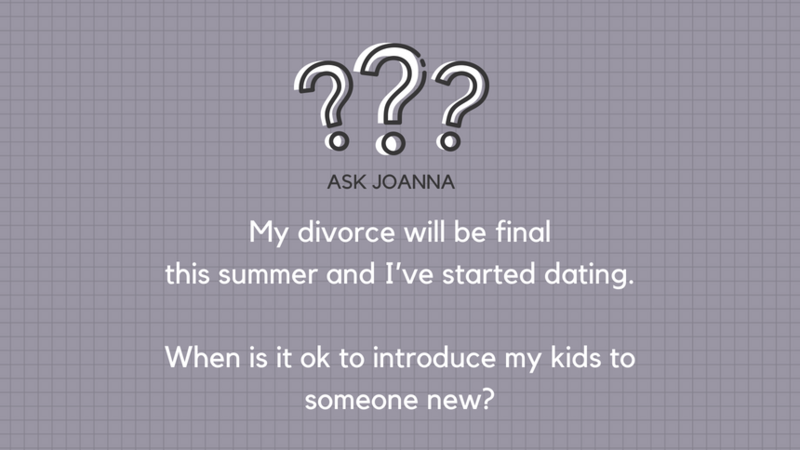 Do you have a general question that you’d like to “Ask Joanna” online? If so, email it to me now. While you’re name is required for submission, all posts will be published anonymously on my site. Please Note: The information provided on this site is for general educational and informational purposes only. It is not intended to be a substitute for seeking professional medical advice, diagnosis or treatment. Although care has been taken in preparing the information provided to you, Joanna Hardis accepts no liability whatsoever for any loss or damage you may incur related to any direct, indirect, consequential, special, exemplary or other damages or losses on account of my contribution above. Moreover, unless you have a signed form of consent and other appropriate documents in place, Joanna Hardis is not your therapist, counselor or coach. Nothing on this website or social media shall be interpreted as entering you into a therapeutic, counseling, advising, coaching or supervision relationship with Joanna Hardis.